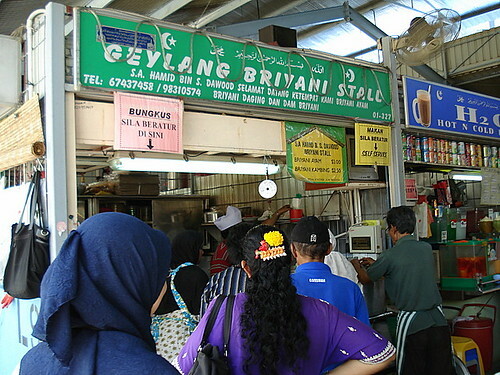 Geylang Serai Briyani aka Hamid's, originally uploaded by Camemberu. That's old Hamid himself. I'm not sure if that's a white chef's hat - more likely a rather large white songkok (skullcap) that symbolises he has done the Hijrah (Muslim holy pilgrimage). My mutton briyani came with the meat hidden inside the rice. The briyani looked a bit more pale than I would have preferred. But no matter, taste was more important and I could not wait to see how it fared there. A bowl of vegetable curry accompanied the rice (it was quite salty though, not my thing). Generous portion of tasty achar added dimension to the dish. Quite a deal for S$2.50, yes. 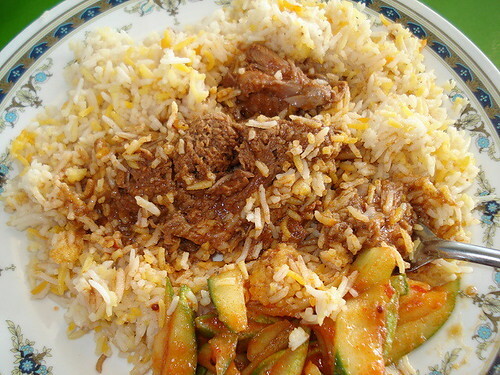 Mutton briyani (kambing), originally uploaded by Camemberu. I tried my darndest to unearth the treasure beneath without making a mess. Not easy. This was a rather watery and soggy piece of meat. The rice stuck to it everywhere. In fact, the rice itself was also very soft. Tender is my name, originally uploaded by Camemberu. You can see how mushy the rice is. 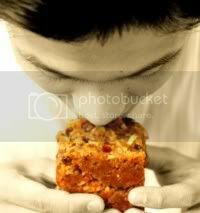 After a while, I gave up wanting to take nice pics, and just dove into the food. True enough, the mutton was melt-in-your-mouth tender and delicious (I just had to be careful of broken bone bits, as mine had a chunk of cut bone included). How did he manage to get such a notoriously tough meat to surrender? The rice was more flavourful in some parts than others but also evoked a "Mmh!" response. Good combi of spices. I just wish it had a better bite to it. 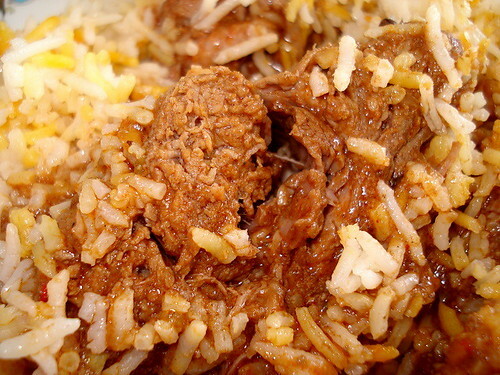 Unfortunately, the combination of mushy rice and mushy mutton meant it felt like I was eating baby food. Really, I could easily mash this and feed it to my lil one if briyani wasn't such a "less-than-healthy" food. 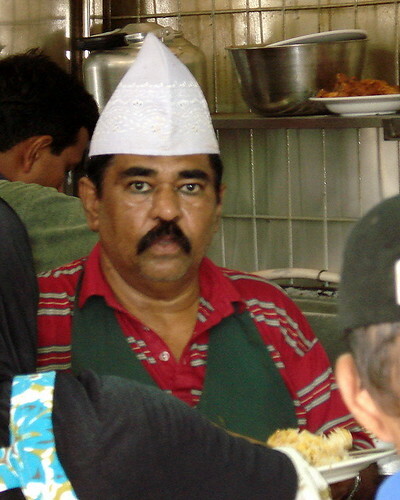 I started reminiscing about some other good briyani I've had. The Golden Shoe food centre one came to mind. I must head back and blog that one. Muthu's also not bad (much better basmati rice) but expensive (even at the food court in China Square, easily $6). 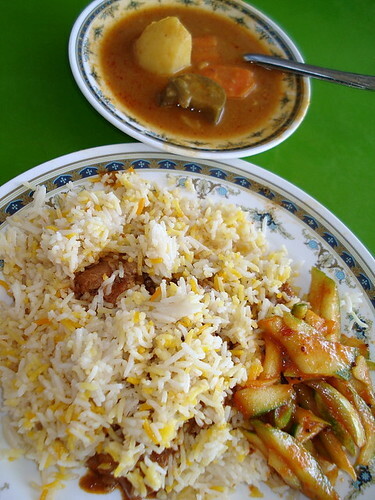 Certainly does not look like the usual rice standard at Hamid's! Been there around 5 times, never seen it so mushy before! Yeah, well, I guess they can have bad rice days. :) Or maybe a new assistant cook. I don't mind going back to try again, to see if it may be better. This is not a good briyani stall. They use low grade rice that I didn't find acceptable to my tastebuds. I had the chicken and it was awfully tough and tasteless. Not going to give it a second try. The low quality rice itself is a total turn-off.